Have you watched the Teenage Textook Movie? When Yuhui plurked about catching the Teenage Textbook movie, I was intrigued. The Teenage Textbook was a book that I enjoyed immensely through my school years. Although I have no watched the movie before, I think that it’ll be quite an experience to watch the book come to life! In a nutshell, the teenage textbook movie revolved around 4 main characters, Mui Ee, a smart but shy girl, her best friend, Sissy Song, the popular school belle, Chung Kai, who secretly harbors a crush on Mui Ee, and his best friend, Hok Sean. We reached Old School at about 8pm and although I’ve been here before, I’m always charmed at how elegant the place was and impressed that it was converted from an actual school! We chose our seats and sat down on the plush seats in the Sinema hall, and waited for the movie to start. I sat there lapping up each moment. The movie was lovely – it was funny, it was witty, and I thought that the cast had good chemistry with each other. The storyline was good albeit it was more of a condensed version of both the teenage textbook and teenage workbook. There were a number of scenes that were taken out, such as the lisping guy who keeps calling Sissy Song as “Thythy Thong” as well as the scene when Tom D’Cruise tried to make his moves on Mui Ee. But that was a problem with many book to movie transition as different people always have different perceptions as to what was important to be kept in the movie and which would be cut away due to constraints. And granted that the quality of the film was rather grainy, and that there were a number of references which was outdated, it was understandable as the movie was produced in 1998. I had a blast recognizing the old “ship” currency, looking at popular spots like Orchard and Holland Village as they were 10 years ago as well as reminiscing about the days when Mark Richmond was deejaying for Perfect Ten. When the movie ended, out comes Adrian Tan, the author, and Phillip Lim, the director to come to talk about the movie as well as a questions and answer session. I was so floored! I always feel a sense of privilege when meeting a creator. And while the both of them were bantering, the audience could sense how at ease they were with each other. I also found out that Phillip Lim gave out directing lessons around the time when he was creating the Teenage Textbook Movie to supplement his income. Turns out that one of his students was Royston Tan, an emerging and acclaimed director in Singapore. 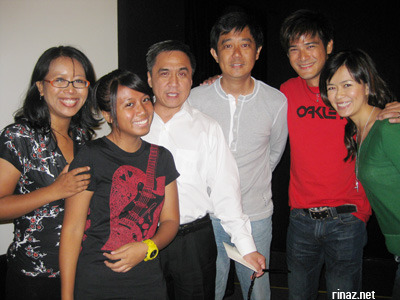 And in the end, I had a picture with the author, the director and two of the main casts in the show. Oh my. I cant believe that I was actually took a picture as well as had a short talk to Adrian Tan. He was a very eloquent and friendly person and I was so in awe and was very excited to the point of almost being delirious. Catch the Teenage Textbook Movie in Sinema! i have an its on of the local movies that i enjoyed. randall and melody are a picture perfect, fairy tale story couple. absolutely touched by her when she took care of randall when he was sick and how they fell in love. Nice movie isn’t it? I remembered watching it like way back in 1998 when life was really different for me. While it may seem a little old skool, some of the charm in the movie lies in how things were portrayed in an innocent honest to goodness way. Something which is sorely missing in this day and age. OMG! I watch this movie years ago! I still have their album too and I enjoy their songs. now i’m interested with the movie. So you have Jer’s You’re my special angel? And John Class’s song too? Wow, it really brought a memory trip when I listened to it. Where did you find that songs by the way? Hehehe, 1998 was a different time for me, being in pre-university, I wasnt much into movies. Watch it! Its worth it! I want to look for the books too! Adrian Tan recently dropped by NTU to give a speech to the graduating seniors during convocation! Woah what an outstanding speech. I bet that most of the attendees there were floored! Did you have the chance to have a chat with him though? yep, i do remember some sweet memories when i chanced upon the the song “my special angel” again today. Its really a great story that i pleasantly enjoyed in my secondary school days. btw, does anyone know where to get the textbook and workbook from the bookstores these days. i would lik to buy them and read it all over again! let me know ya.. cheers!